Financing from as low as 3.9% for up to 60 months. 1% Rate Reduction for existing customers. Equipment Includes: Premium package, sport package, heated steering wheel. *Finance offers available O.A.C. 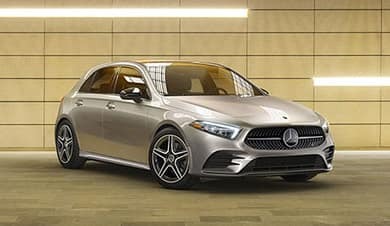 from Mercedes-Benz Canada Financial Services based on a 2019 A 250 4MATIC Hatchback with an annual finance rate of 3.9% for up to 60 months. First month’s finance payment + HST is due on signing. Cash purchase price of vehicle is $45,960. Licensing, registration, and applicable taxes are extra and due on signing. Implicit Finance Charge is $5,330.18. All amounts are in Canadian Dollars. Fees may vary by dealer. Dealer may sell for less. Offer only valid until April 30, 2019, and may not be redeemed for cash or combined with other offers. Performance Mercedes-Benz reserves the right to amend or terminate this offer, in whole or in part, at any time without prior notice. Additional conditions and limitations may apply. Please see Performance Mercedes-Benz for details. Financing from as low as 2.9% for up to 60 months. 3 Payments Waived for a limited time (up to $1,950). Equipment Includes: Premium package, heated steering wheel, 18" multi spoke wheels. *Finance offers available O.A.C. 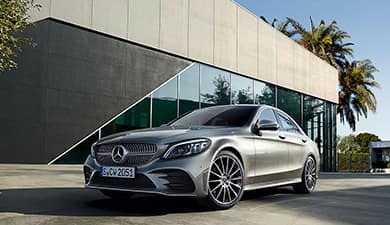 from Mercedes-Benz Canada Financial Services based on a 2019 C 300 4MATIC Sedan with an annual finance rate of 2.9% for up to 60 months. First month’s finance payment + HST is due on signing. Calculation of total payment includes waiver of first three finance payments for a maximum total amount of $1,950. Cash purchase price of vehicle is $53,120. Licensing, registration, and applicable taxes are extra and due on signing. Implicit Finance Charge is $4,542.58. All amounts are in Canadian Dollars. Fees may vary by dealer. Dealer may sell for less. Offer only valid until April 30, 2019, and may not be redeemed for cash or combined with other offers. Performance Mercedes-Benz reserves the right to amend or terminate this offer, in whole or in part, at any time without prior notice. Additional conditions and limitations may apply. Please see Performance Mercedes-Benz for details. Financing from as low as 1.9% for up to 60 months. 3 Payments Waived for a limited time (up to $1,800). Equipment Includes: Premium package, sport package, command navigation, Sirius satellite radio. *Finance offers available O.A.C. 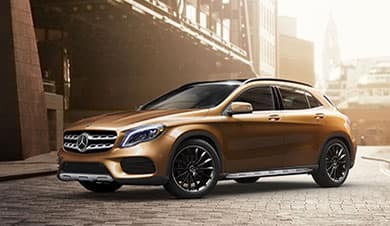 from Mercedes-Benz Canada Financial Services based on a 2019 GLA 250 SUV with an annual finance rate of 1.9% for up to 60 months. First month’s finance payment + HST is due on signing. Calculation of total payment includes the waiver of first three finance payments for a maximum total amount of $1,800. Cash purchase price of vehicle is $45,844. Licensing, registration, and applicable taxes are extra and due on signing. Implicit Finance Charge is $2,548.86. All amounts are in Canadian Dollars. Fees may vary by dealer. Dealer may sell for less. Offer only valid until April 30, 2019, and may not be redeemed for cash or combined with other offers. Performance Mercedes-Benz reserves the right to amend or terminate this offer, in whole or in part, at any time without prior notice. Additional conditions and limitations may apply. Please see Performance Mercedes-Benz for details. 3 Payments Waived for a limited time (up to $2,250). Equipment Includes: Premium package, LED lighting system, metallic paint. *Finance offers available O.A.C. 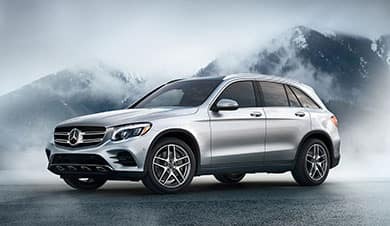 from Mercedes-Benz Canada Financial Services based on a 2019 GLC 300 SUV with an annual finance rate of 2.9% for up to 60 months. First month’s finance payment + HST is due on signing. Calculation of total payment includes the waiver of first three finance payments for a maximum total amount of $2,250. Cash purchase price of vehicle is $54,860. Licensing, registration, and applicable taxes are extra and due on signing. Implicit Finance Charge is $4,690.78. All amounts are in Canadian Dollars. Fees may vary by dealer. Dealer may sell for less. Offer only valid until April 30, 2019, and may not be redeemed for cash or combined with other offers. Performance Mercedes-Benz reserves the right to amend or terminate this offer, in whole or in part, at any time without prior notice. Additional conditions and limitations may apply. Please see Performance Mercedes-Benz for details. 3 Payments Waived for a limited time (up to $3,150). Equipment Includes: Premium package, lighting package, 18" AMG 5 spoke wheels. *Finance offers available O.A.C. 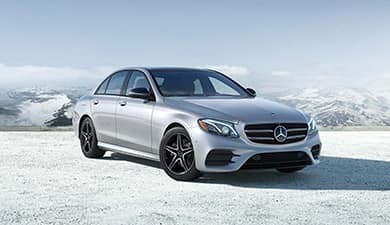 from Mercedes-Benz Canada Financial Services based on a 2019 E 300 Sedan with an annual finance rate of 1.9% for up to 60 months. First month’s finance payment + HST is due on signing. Calculation of total payment includes the waiver of first three finance payments for a maximum total amount of $3,150. Cash purchase price of vehicle is $67,370. Licensing, registration, and applicable taxes are extra and due on signing. Implicit Finance Charge is $3,741.88. All amounts are in Canadian Dollars. Fees may vary by dealer. Dealer may sell for less. Offer only valid until April 30, 2019, and may not be redeemed for cash or combined with other offers. Performance Mercedes-Benz reserves the right to amend or terminate this offer, in whole or in part, at any time without prior notice. Additional conditions and limitations may apply. Please see Performance Mercedes-Benz for details.